This is MBA summer training report on "performance appraisal system in Minda Industries ltd. Rudrapur". Performance Appraisal System play very important role in any industry and need to be studies in detail. Today in every organization personnel planning as an activity is necessary. It is an important part of an organization. Human resource planning is an vital ingredient for the success of the organization in the long run. You can also Subscribe to FINAL YEAR PROJECT'S by Email for more such projects and seminar. Performance appraisal involve rating of past performance of the employee and setting new performance objective. A performance management system benefit the organization by ensuring that that the day to day activities of employees are aligned with, and promote the organization goals. 1. 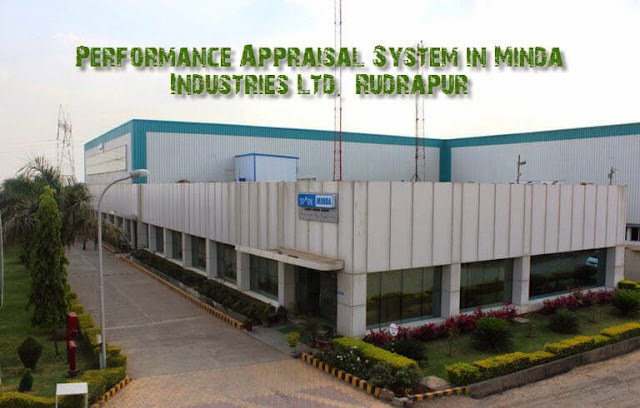 To understand existing Performance Appraisal System at MINDA INDUSTRIES LTD.
2. To evaluate the Performance Appraisal efforts of Minda Industries Ltd.
3. To make suggestion for any corrective measures on the basis of the evaluation done to improve the Performance Appraisal efforts. 4. To find out that biasness can affect the performance appraisal of employee. The employee benefit by having regular feedback on performance and being provided with development opportunities to improve their performance. A critical aspect often overlooked is that not only goal achievement is important, but how the goal was achieved is equally important, the corporate responsibility aspect. It is unrealistic to expect that when a performance management system is implemented, employee will immediately be motivated to perform better, and any performance issue (perceived or real) will be immediately resolved. To realize the full potential benefit from the performance management system, the organization must be prepared to invest resources to ensure that the employee and managers own the system, otherwise it will be treated as a compliance activity and neither the employee nor the organization will benefit from the system. No performance management system will ever be perfect or complete, and as the organization evolve, so must the performance management system must be evolve with the organization. This report will review the common issue, encountered with performance management system and provide recommendation for implementing a performance management system with in an organization.